Yesterday it rained and rained and rained. This rain was the classic Pacific Northwest autumn rain that buckets down for hours, for days. Forty-four degrees and wet–perfect hypothermia weather. Perfect staying indoors weather and being grateful for a sturdy roof. 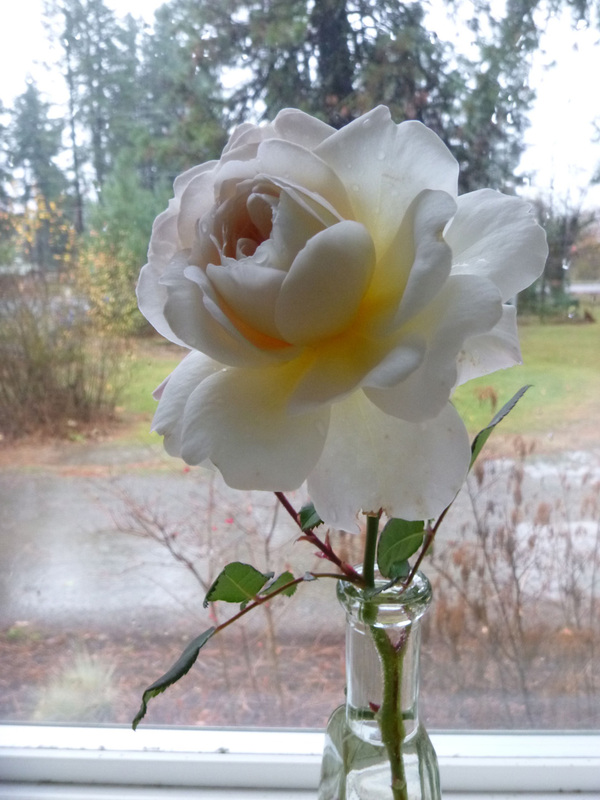 I ran out with my garden clippers because I could see the last rose blossom of the season being pelted by water. Its name is ‘Crocus Rose’ and it’s a David Austin rose. He is the modern breeder of old English roses. As a gardener, I prefer rose bushes with a loose floppy habit because they fit in with my tangles of perennials. If they bloom repeatedly during a season and smell good, I like them even better. This one fits the bill and finally appears to be thriving since I planted it a few years ago. I’m especially glad to be able to enjoy it since I was separated from my cottage and garden for nearly half a year. The blossom stands in a vase on my dining table where I can gaze upon its slightly scalloped ivory-cream-buttery-pale peachy petals, and stoop for a sniff. Flowers in the house are a treat during this hunkering in time of year. I baked tart apples with cinnamon and brown sugar, and vacuumed up all the dried leaves that had been tracked in from my dashes outside. I sipped tea all afternoon as I padded around the house and studio in my felt flippers. There is nothing as satisfying as a cozy house as fall turns to winter. I imagine the highest mountains being plastered by wet snow, and millions of droplets dripping from tree needles, water soaking the ground and running downhill to creeks. The creeks run into the rivers and the rivers meet human-made dams. The dry reservoirs are filling, holding water for people and fish. That’s what hunkering at home feels like–the reservoir is filling after a long hot dry summer. So ends fire season. Hooray! The snows are, indeed, visible, and creeping lower. Each culvert and cut were rushing with urgency and froth.